been a hearty one indeed. Presently a further step was taken, and the requirements of both literature and the toilet, a curious combination, were considered conjointly, and this led to the production of models of the type portrayed in Fig. 4, Plate V. Is it possible that this introduction of the large toilet mirror in connection with the writing-table was a direct hint to the literary men of the day that the physical results of the " poet's frenzy/' or the ill-treatment of the hair consequent upon the struggle to shape a pleasing phrase, or discover an apt quotation, called for rectification before departure from the scene of operations? At all events, it is more than possible that in such a glass as this Addison may have adjusted his peruke after the penning of one of Will Honeycomb's escapades, or Pope after putting the finishing touches to the "Odyssey." The advantages associated with even these dainty little bureaux, small as they were, were so great and obvious, that there was a demand for their enlargement in order that even greater comfort and accommodation should be provided for the literary worker. Thus, in the course of time, the "bureau-bookcase" was evolved, and took, as one of its forms, that which is represented in Fig. i, Plate IV. ; an example at which the great John Wesley himself did much of his writing when at home from his memorable journeyings. 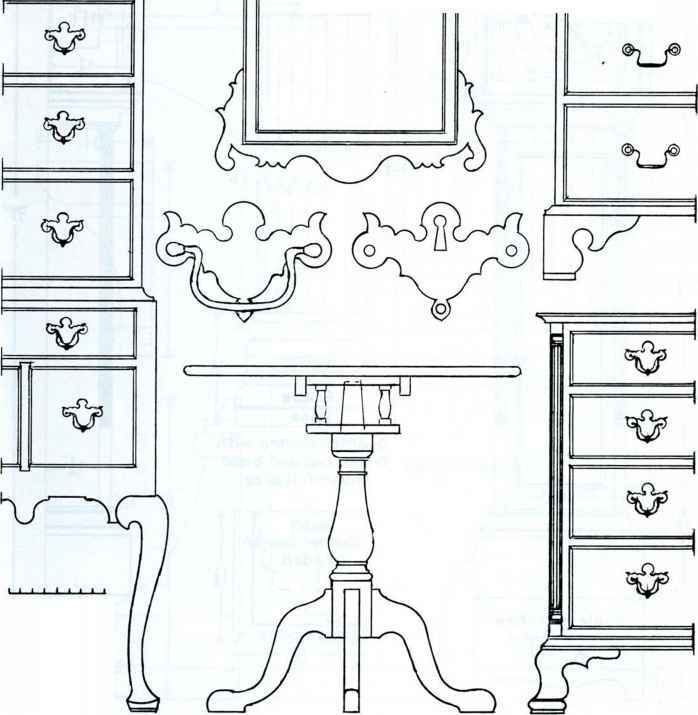 By such stages the " bureau - bookcase," "escritoire," "secretaire," or "secretary," grew from the simple desk supported by four turned legs, as we saw it in a preceding chapter, into an article of its present importance, and became one of the most indispensable pieces of furniture in every well-appointed eighteenth-century English household. Here we may leave it, in order to resume its consideration later.